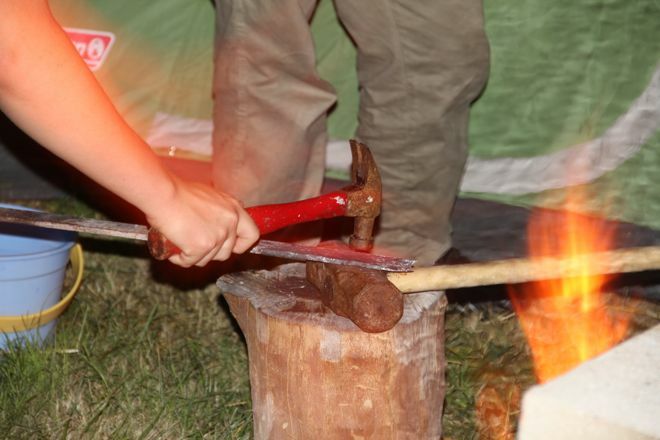 The first round of forging came Saturday night, when Alex and Max got the campfire white hot, and decided to try hammering the metal scrap Alex found at the beach last year. But, no. No, it really began in February, 2001, when I taught the boys how to build fires, and let them start all kinds of fires for heat, for cooking, for fun. Every campfire since those first, Tacupeto fires, have raised the questions... how hot is the fire, and can we melt metal? 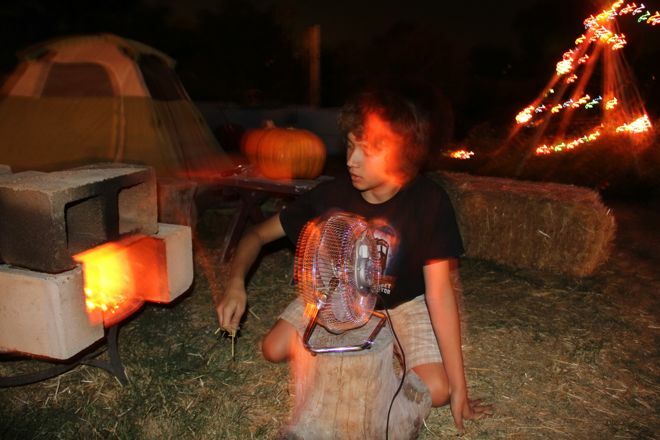 Whether in our backyard, at a local park, or camping along the California Coast, my children have always enjoyed learning about, and experimenting with, fire. And for several years I know they have been eager to build a forge. An awesome part of their high school... they've all taken metals and worked with welding, and some blacksmithing. Maria cannot wait for her turn! 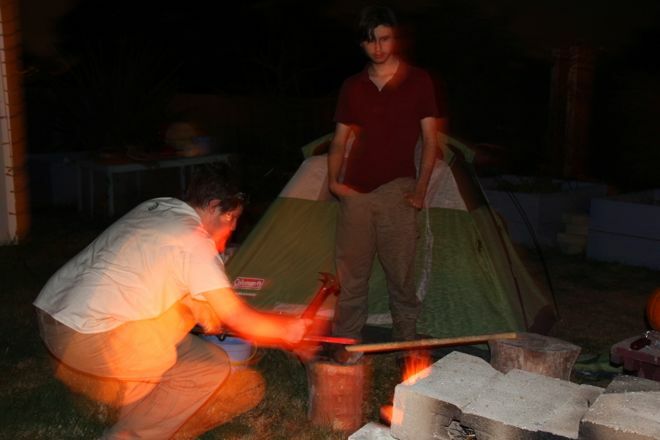 Okay... so, after dropping a bar of aluminum into Saturday's campfire, and finding a gnarled and beautiful molten heap in the still hot ashes Sunday morning, their interest in this forge business was reignited. Lucas was over later that day, and they got to work. Using some cinder blocks (I love free-cycling curb gifts! Thanks, neighbors!) they made an oven over our fire ring (I love free-cycling gifts! Thanks, Anna Banana!) Up to the minute impressions from FB friends were helpful, too, and thanks to Aunt Carol and her reminder that Grandpa Van would strongly suggest they roll back those straw bales! 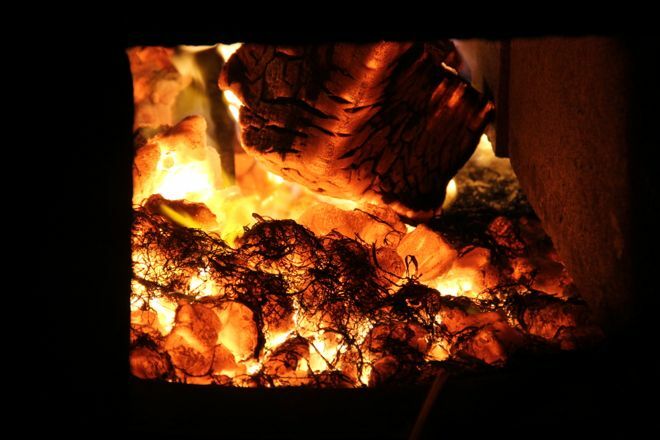 With Maria operating the fan, and even old fashioned bellows at work, the forge reached temperatures high enough to heat a piece of metal to red hot, which according to Wikipedia may have been as high as 1400 degrees Fahrenheit! The end of the 1/4" thick metal was slowly, steadily hammered down to as slim as 1/16th". The best part, of course, was how much fun they had. Always something interesting going on at your house! That's hot but I don't think it would melt our snow. It's freezing here and I am jealous of your weather! 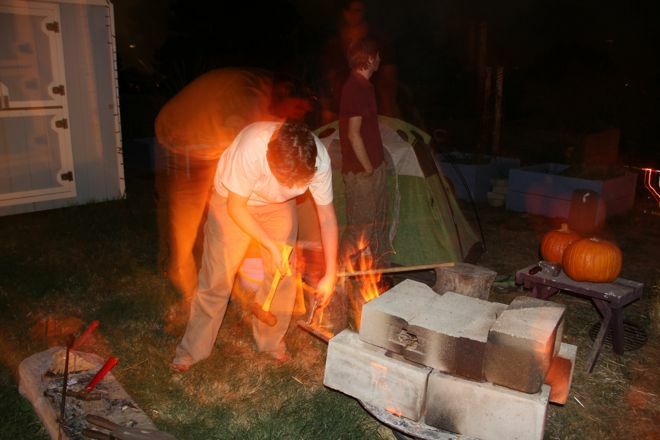 Anyhow we are now studying building a forge. I have blown glass before and loved the flame. Can't wait to see what you do!